City and regional membership organizations partner with Livability Media to fulfill a primary part of their mission — to foster growth. Today, that means using all the tools at your disposal — print, digital, and social — to highlight what's good about living in your community or region. More than 35 million people relocate every year for personal and business reasons. Even in small towns, new faces rotate in to fill positions in health care, education, manufacturing and other businesses. That’s why communities like yours have to make sure they don’t get lost in the shuffle, or worse, make a weak impression in the wildly competitive world of search, links and social media. Partnership with Livability Media provides an array of marketing tools that will help your community stand out. We’ll create a top-quality print magazine that captures the heart and soul of your community or region. That means stunning photography and engaging articles based on research that tells us what readers really want to know. Think print is sick or dead? Think again: our magazine designs are also guided by research – on changing reader preferences for brevity, visual information and more online referrals. We’ll create a vivid digital version of your magazine that can be displayed on your website and other relevant local sites. The digital version can easily be emailed or shared on social networks. (Who reads digital magazines? Individuals who tend to be more educated and affluent – an extremely attractive slice of any target audience). Dedicated pages on Livability.com, a national website focused on small to medium sized cities and why they are great places to live, work or visit. A city page and a sponsored landing page tell your story in articles, photos and infographics – all easily viewable on mobile devices. Once your pages are posted on Livability, we’ll begin connecting your story with people waiting to hear it on social media or actively looking for it in their own searches. In fact, we’d love to discuss our paid and unpaid strategies for sparking interest in cities or regions on the leading social networks. We’ve got some great case histories to share. And Livability’s traffic is growing. 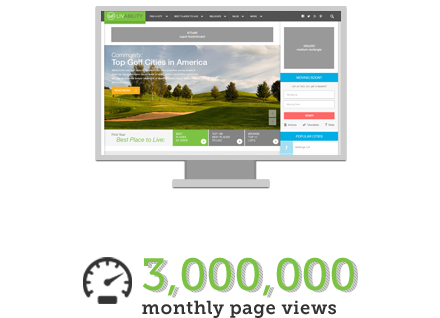 Nearly 10 million visits over the past 12 months. And on pace for 11 million in 2017. Ready to hear how we’ve helped raise awareness for other cities and regions?